These healthy flourless brownies are soft, cakey (or fudgy!) and deliver a rich dark chocolate flavor that will satisfy your sweet tooth without any unhealthy ingredients. Plus, they are so easy that you can whip them up in less than 30 minutes! 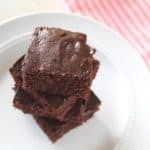 I wanted to create a delicious rich chocolate brownie recipe that is simple to throw together, but also has healthy paleo, keto and gluten-free ingredients. So far this recipe is a hit! In fact, I have a hard time keeping my husband from eating the whole pan. I’ve made this recipe several times since creating it and it has become one of our favorite simple and sweet recipes. 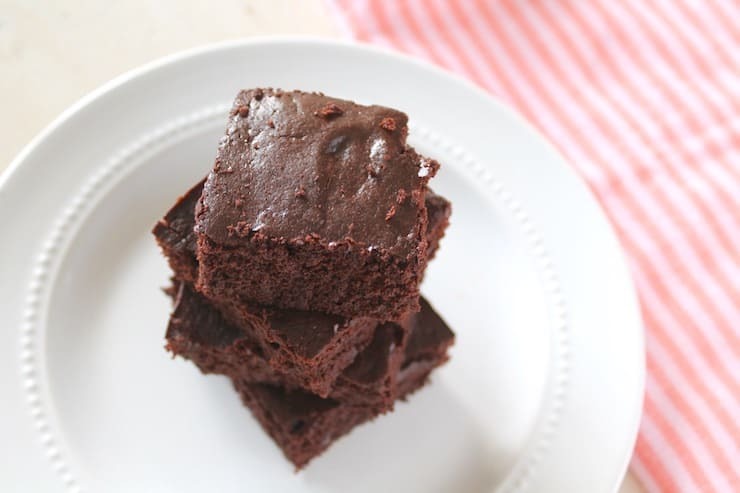 These flourless brownies are so quick and easy to make. You basically dump everything in a mixing bowl, then put it in the oven. Healthy homemade dessert in less than 30 minutes! 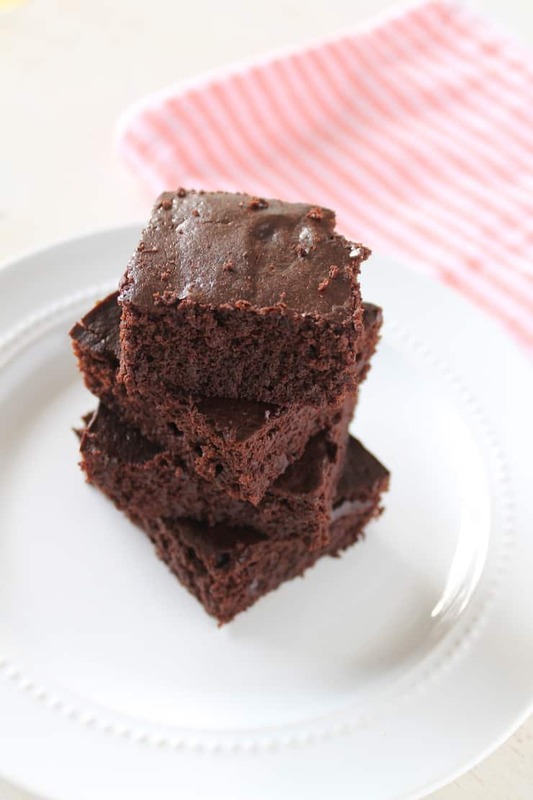 There is no flour in this brownie recipe since cocoa powder makes a great flour substitute. It’s naturally paleo and gluten free and can even be made low carb/keto as well. This is a great easy dessert to bring to potlucks, holiday parties or as a tasty gift. These flourless brownies are especially yummy with a glass of milk (or homemade almond milk) or a scoop of ice cream (or homemade coconut ice cream!). I’ve made this recipe both with coconut sugar and with sugarless low carb/keto sweeteners like monk fruit sweetener. If you are using a keto sweetener, you may need to add more milk to balance it out. If your batter seems a bit dry, add 1 tbsp at a time of milk until you reach the right consistency. You can also use either cocoa powder or cacao powder (which is what I used). Cacao is almost the same as cocoa in the way it is used in cooking, but it is raw and is not processed with high heat and pressure like cocoa is. 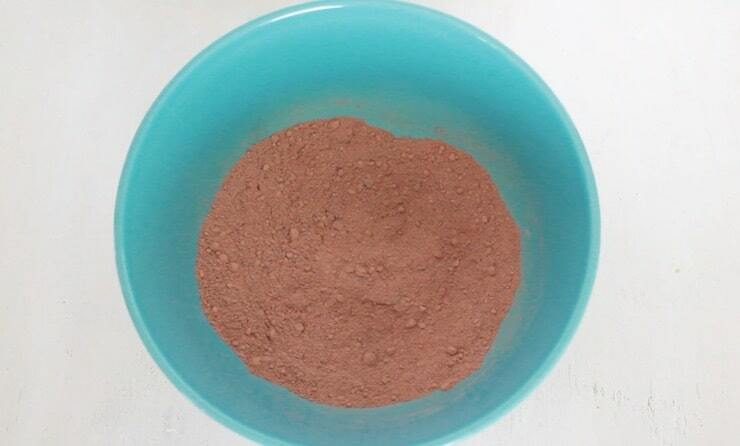 It also has a better nutritional profile including higher beneficial antioxidant content than than processed cocoa powder. The type of cocoa or cacao that you use may also affect the moisture of the batter so you may have to add a bit more milk here as well. 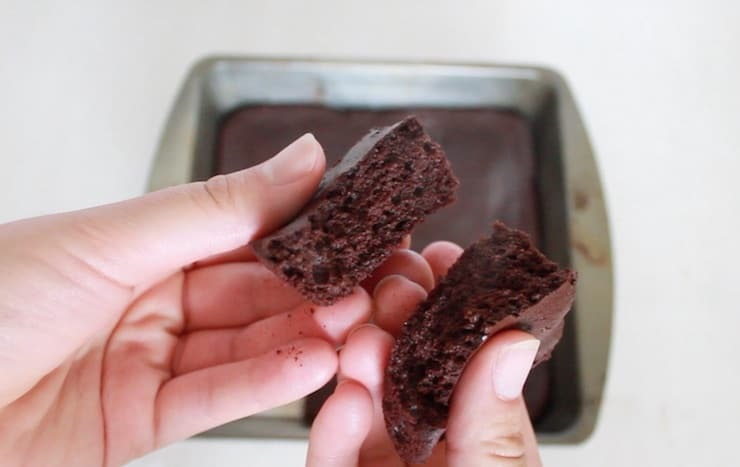 If you prefer a more fudgy brownie, omit the baking soda. 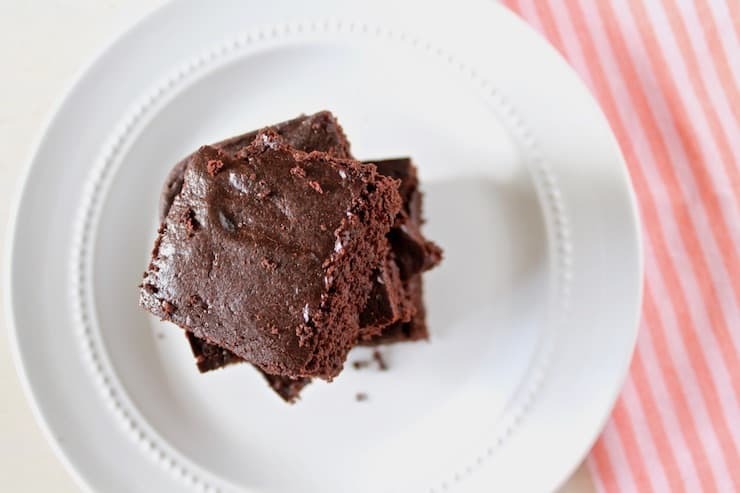 These brownies are not too sweet and are reminiscent of dark chocolate, but if you prefer a sweeter brownie, add a bit more sweetener and a bit more milk to balance out the texture. Preheat the oven to 350°. Combine all of the dry ingredients including the cacao powder, sweetener, baking soda and salt. Then, add the wet ingredients including the eggs, coconut oil, milk and vanilla extract. Mix to combine. Use a food processor, hand blender or electric whisk to beat out any lumps. Coat an 8×8 pan with coconut oil or line in with parchment paper. Pour the batter into the pan and make sure it is spread evenly. Bake for 15-20 minutes or until a toothpick inserted comes out clean. Enjoy by itself or with some homemade coconut ice cream! Did you like Amazing Healthy Flourless Brownies (Keto, Paleo, Gluten-Free)? Don’t forget to rate the recipe and leave me a comment below. You can also follow me on Facebook, Instagram, Pinterest! Set oven to 350°. In a mixing bowl or food processor combine all dry ingredients (cacao powder, coconut sugar, baking soda, sea salt). Add the wet ingredients including the eggs, milk, coconut oil and vanilla and blend together. If you are using a keto sweetener, you may need to add more moisture to get the right brownie batter consistency. Add 1 tbsp at a time of milk to the mixture until you get the right brownie batter texture (see video below for consistency). Grease an 8x8 square pan with coconut oil and pour the batter into the pan. Bake at 350° for about 15-20 minutes until a toothpick inserted comes out dry. 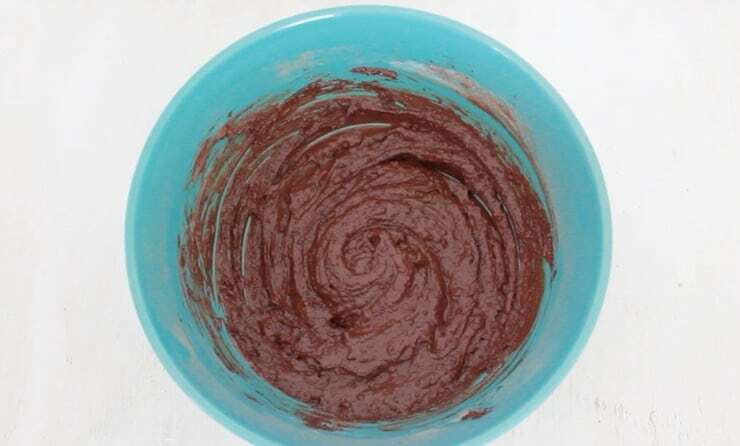 If you are using a keto sweetener like swerve or granulated monk fruit, you may need to add more moisture to get the right brownie batter consistency. Add 1 tbsp at a time of milk to the mixture until you get the right brownie batter texture (see video below for consistency). You can also use either cocoa powder or cacao powder (which is what I used). The type of cocoa or cacao that you use may also affect the moisture of the batter so you may have to add a bit more milk here as well. 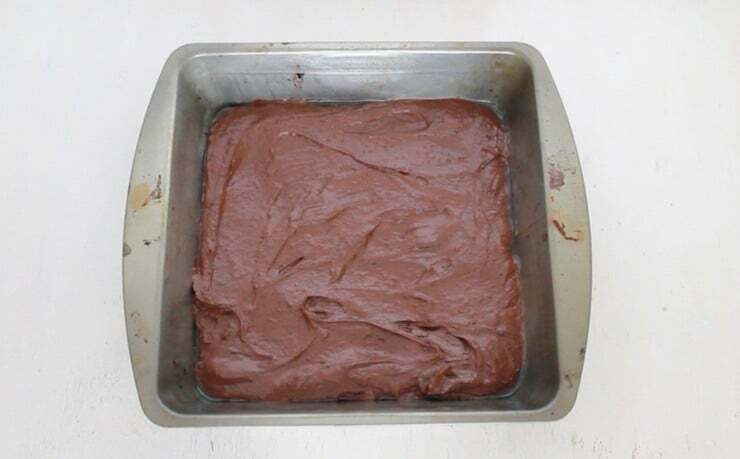 If you prefer a more fudgy brownie, omit the baking powder. Nutrition Facts below are for brownies made with canned coconut milk and coconut sugar. I love that your brownie recipe uses “normal” ingredients – the sort of things that are easy to find and non-paleo folks may actually have in their kitchens. These look delicious! This looks amazing! Excited to try it out! Thanks Stephanie! Healthy desserts are the best! I have everything you call for in my pantry! Guess what I’m making this weekend?!!! Yay! Hope you enjoy them, I sure do! These look amazing! We’re paleo, yet I never really understood the difference between cacao and cocoa! Thank you for explaining that. 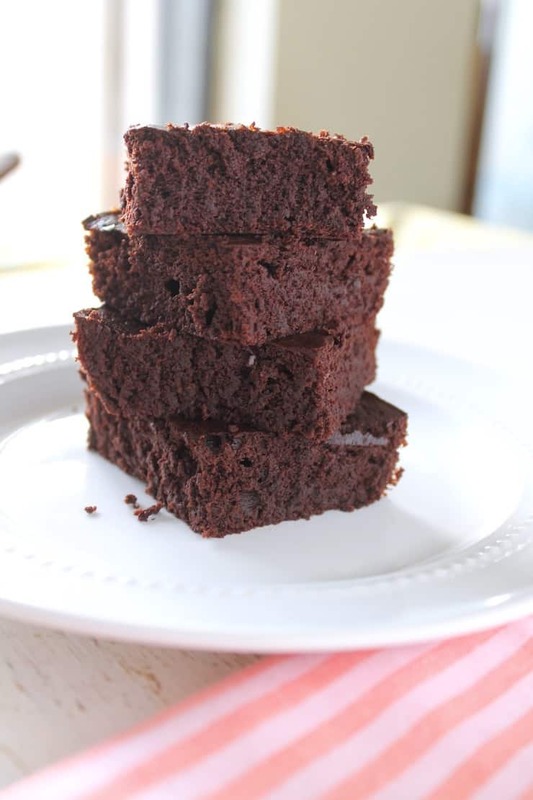 These brownies look so moist and chocolatey. A must try. Im always looking for flourless brownies! Going to try this out this weekend! My husband is headed to work for his first Saturday shift tomorrow- this looks like the perfect thing to surprise him when he gets home. A healthier alternative for celebration! How sweet of you! I bet he’ll be so happy! I love brownies! I will have to try this!.. thanks for sharing!! This looks SO yummy! Plus, I have Celiac so absolutely have to eat gluten free, so these brownies are perfect for me. Thanks for the recipe! Does the coconut milk make them taste coconut-y? If so, is there a substitute I can use? Nope! You don’t taste the coconut. You can sub with regular whole milk if you want. The recipe says canned coconut milk… with the fat, or without? Shaken can, or skimmed? It might not matter, I just wondered what you did. Too much fat could make them oily, which would mean reducing the softened coconut oil to balance. These do look delicious, and I have all the ingredients in the pantry. Thanks! Yes, it should be with the fat, shaken can. I tried these with the cacao and they turned out lovely but way too rich dark chocolatey. I should have tasted the batter first but what would you recommend to take the edge off? Maple syrup? liquid stevia? The consistency was awesome and they were certainly pretty! Yes, they are meant to be pretty low-sugar and dark chocolatey! You can try adding a little maple syrup or a little extra coconut sugar. You can also try adding whole milk or half and half instead of coconut milk. If you do add more coconut sugar add a small amount of additional milk too. Oh my god this is honestly my absolute favorite sweet thing to eat!!!! It’s just so so so gooood! ???????????????????????? I love your Healthy Flourless Brownies recipe. I would love to feature it in our website Greenthickies.com. I will not be posting the actual recipes, but I will only use one image from the post, title, a small quote and link directly back to your post. I tried this recipe and hacked it by adding a whole banana, some agave syrup, walnuts and dark chocolate – the brownies smelled delicious coming out the oven. I’m going to enjoy them tonight. I made theses last night for the first time. The flavor was delicious but turned out very dry. I am a baker but no experience with “flourless”. Any suggestions? My thoughts are to reduce cook time, use more coconut oil. Sorry you had that experience! I haven’t had that experience of them being dry. Did you make any changes to the recipe as written? I think more coconut oil or milk would probably help with that. Would they still work if I substitute the coconut oil with butter? Yes, I think that should work ok! Hi. If I use a sugar sugar substitute, can you please tell me the number of calories per serve? I just made these, and they needed about 5 minutes extra in the oven before they were done. Be sure to let them cool for 30 mins first.